A new free app called Touché is now available for all Mac users which enables them to run Apple’s hot new Touch Bar feature as any app and try out some of its features and functionality without having to buy Apple’s new MacBook Pro. Here are the details. Apple’s recently announced 2016 MacBook Pro models may have come in for some serious criticism for a variety of reasons amongst the Apple elite, but one of the features on which most can agree is the Touch Bar, and most agree that it has potential. MacBook Pros with the Touch Bar and Touch ID built in are now on sale, but if you are just not willing to spend that much required in order to give the new functionality a try, or simply want to decide whether the Touch Bar is right for you or not, you’ll be pleased to learn of Touché, an app that brings the Touch Bar to any Mac. Sort of. 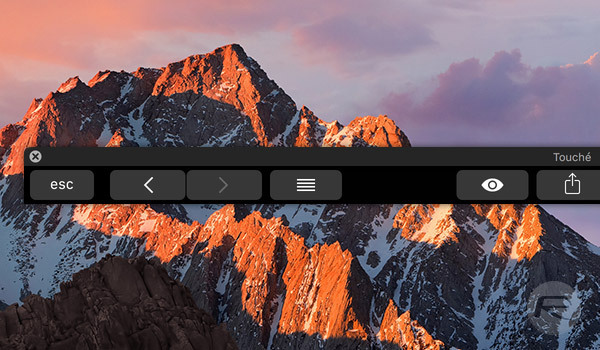 Created by developer Daniel Jalkut of Red Sweater Software, Touché allows users to effectively run the Touch Bar as an app on their Mac, giving them the opportunity to try out some of its new, advanced features whilst also making it possible for them to take screenshots of apps that take advantage of it – such as the ever-popular 1Password. Both functions can have custom keyboard shortcuts assigned to them. Whilst this app won’t be a viable alternative to the Touch Bar moving forward, just being able to try it out a little is enough to have me convinced that I need Touch Bar in my life. Touché for Macs can be downloaded from the Red Sweater Software’s portal at red-sweater.com/touche so long as you meet the specifications required for it. Best of all, it’s free! Touché requires macOS 10.12.1 or later, but there’s a catch! You must have the very latest 10.12.1, with system support for the Touch Bar. If your 10.12.1 version is specifically 16B2657, you’re good to go. Daniel Jalkut is one of the good guys, so if you do make use of the app, please do try to reward him for his work. It’s only proper, folks. Will this work with the Duet app to make a Touchable fake Touch Bar on an iPad as a second screen?